Community Lunches Helped by New Kitchen! If you’ve never participated on one of our weekday community lunches, you’re missing something special. Lunch is served from 11:15-12:15 at St. Stephen’s Episcopal Church on Mondays and at Charter House Tuesday through Thursday. The atmosphere is convivial, the food is superb, the décor is upbeat, and it costs from zero to whatever you want to donate. It is not unusual to have 50 or more guests in the dining room with take outs available. The meals served by different faith communities and interested groups are using our newly renovated kitchen facilities at Charter House. It has made meal preparation easier and safer for lunches and the meals associated with our shelter programs. 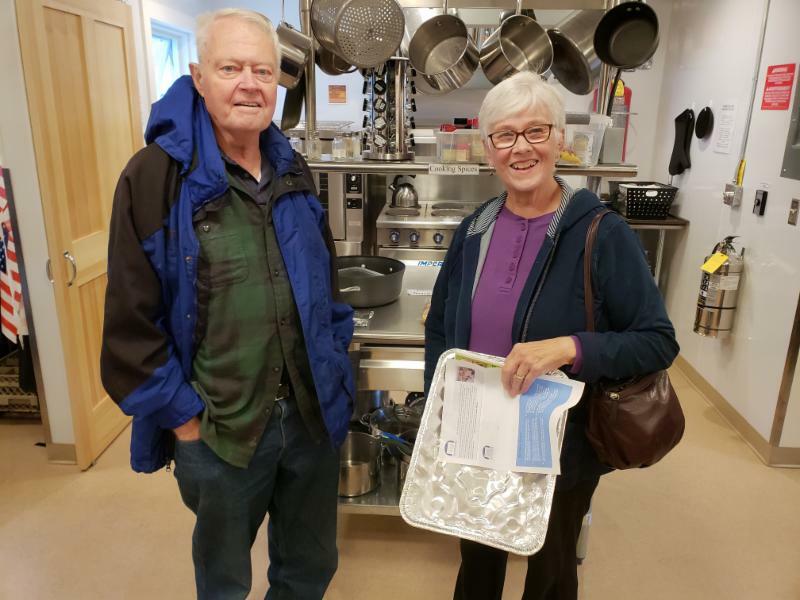 Bill and Jean Fifield admire the new Charter House kitchen. When someone took note of homeless people sleeping around Middlebury last summer a vibrant community discussion started. People who were usually overlooked were given attention and Charter House Coalition did something about it. We opened our home for individuals in need on September 1, 6 weeks ahead of our customary opening date of October 15. Around a dozen people were served every night. Several people were generous with donations to help us defray added expenses. We are very grateful for their help. On October 15, Charter House opened the family shelter and the full program for individuals who need of a place to live. To date, the family shelter has been at or near capacity with many children under the age of five. The shelter for individuals has a capacity for 24 men and women and has increased usage as temperatures drop. Neighbors Helping Neighbors, we live by that principle at Charter House Coalition – and we love seeing it become a reality in Addison County. After a year and a half of careful planning and prioritization, Charter House Coalition unveiled a funding drive to renew our 220-year-old house. Starting last summer, we began reaching out to individuals, foundations, and businesses to help pay for these vitally needed projects. We have an attractive booklet that describes what we would like to accomplish and a “pay as we go” strategy for how the projects will be done. If anyone hasn’t seen the booklet, we’d be glad to send one. Contact us through our website at charterhousecoalition.org. Our goal is to raise $550,000 over 3 years. We have pledges for $375.000 to date. Thanks to all who have given or pledged so far! The renovation of our kitchen, needed electrical repairs, installing fire doors, and raising railings to meet safety codes are examples of projects already accomplished. Our current priorities are to install a mandated accessibility lift and replace a 70-year-old heating plant. We will keep you updated as we go.